Earlier today, I went to pickup our farm share on my way home from work. It was a truly beautiful day: sunny with temperatures in the mid 70's and a breeze. Living in the Northeast, it's only the third week of the season and it was the first time I had enough time to pickup my daughter before they closed. For some reason, I was really excited to bring Maggie with me for our CSA pickup together. When we approached the tent to pickup our weekly produce, one of the farmers looked right at me and said "Are you feeling motivated?" It was just after 5pm on a Friday, but I lied and said "of course" with a smile. Within minutes, Maggie and I were walking through a strawberry field with two empty quart containers. 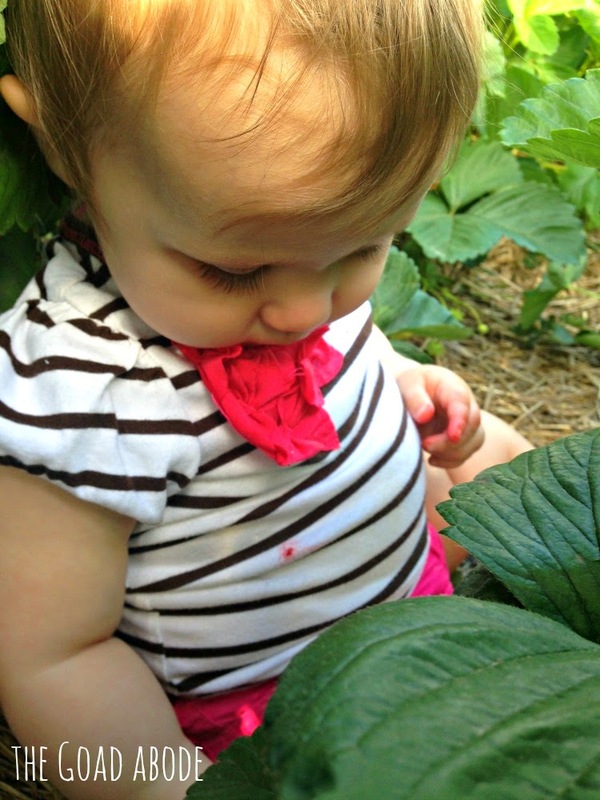 Part of me questioned how I was going to pull off filling two containers without a baby carrier/stroller and the other part of me got lost thinking about the last time I went strawberry picking. It was about 15 or 16 years ago: my mom picked me up from school and we went to a pick your own strawberry patch about 75 miles northwest of where I was standing. Earlier this week was the 13 year anniversary of my mom's passing. Not a day goes by without missing her and now that I'm a mother, I'm even more aware of her profound influence on my life. 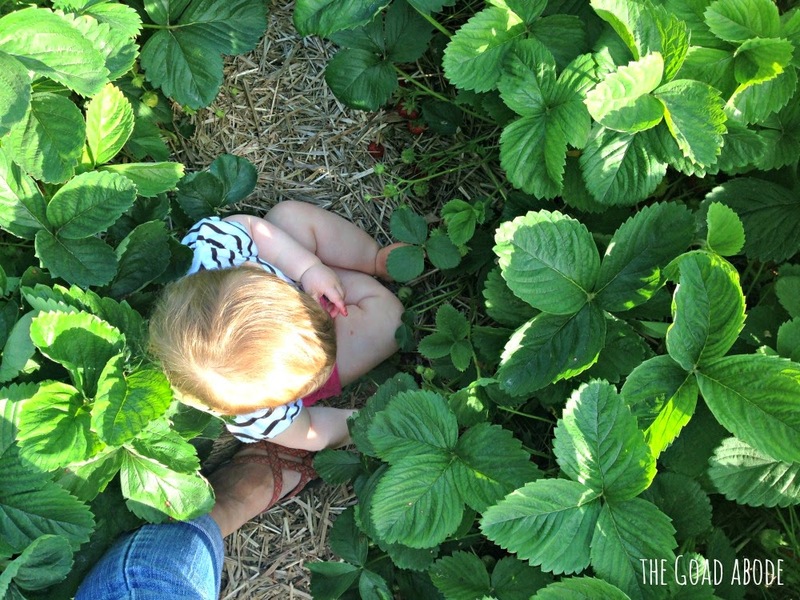 I looked down at my daughter sitting near my feet and picked strawberries to fill our baskets, while she took them out and plopped them in the dirt. Instead of cringing at the bruised berries, I handed her my keys to play with. If you would have told me 16 years ago I'd be giddy to be handed two empty baskets to fill with strawberries on a Friday evening with my 11 month old in tow, I probably would have laughed out loud. 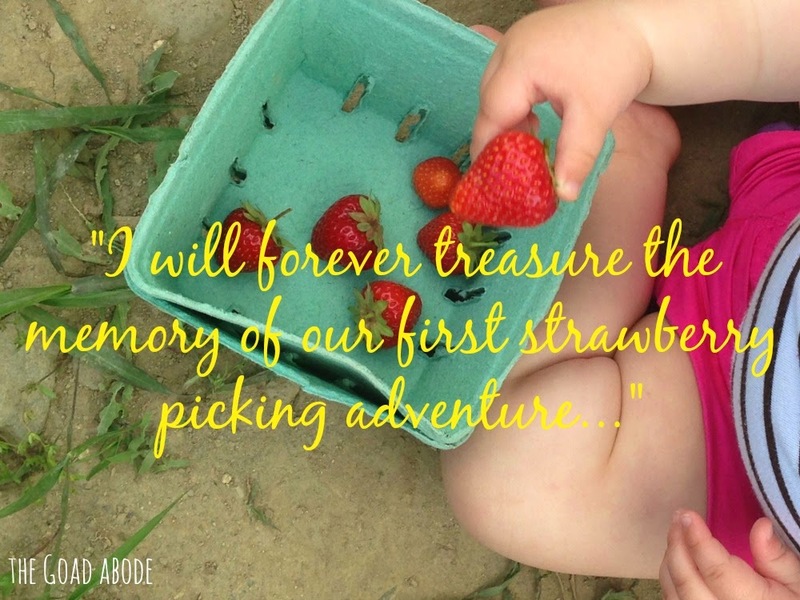 It's the simplest things that bring the most joy as a mother; I will forever treasure the memory of our first strawberry picking adventure, unplanned and uneventful as it was. It's only one more month until Maggie's first birthday. I can hardly believe it. 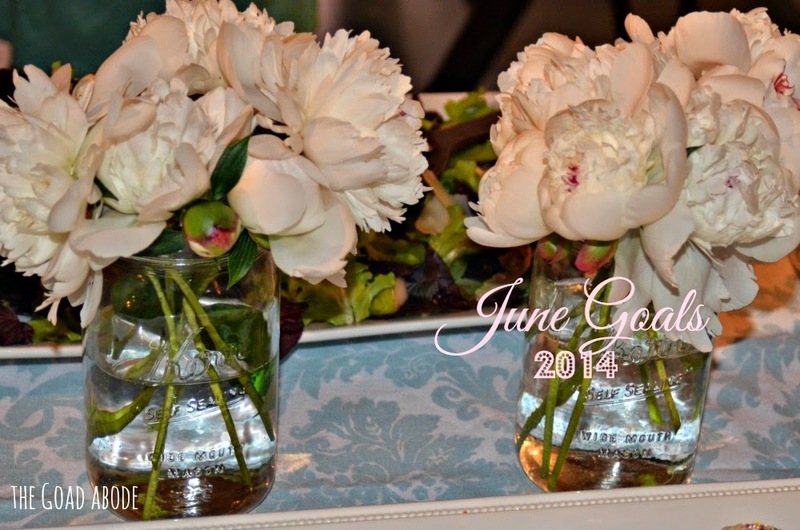 The last year has gone by incredibly fast, yet I have treasured so many milestones. I love these photos because I feel like they sum up the last month quite well. It's all a blur! 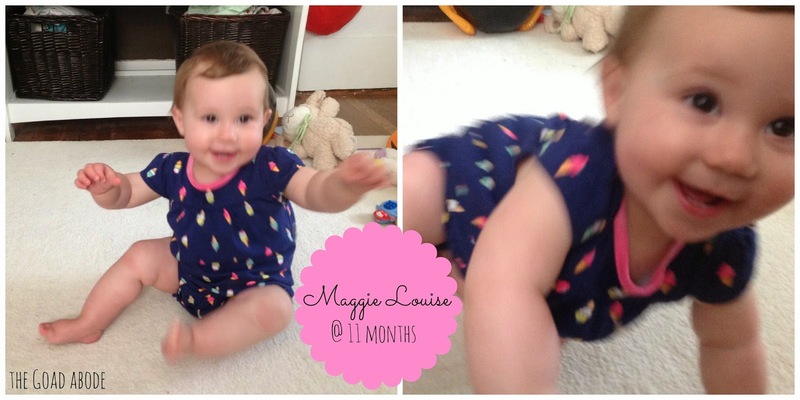 Maggie's moving faster each day (or so it seems) and getting a clear photo of her is more challenging. I love looking back at photos and seeing her hands/feet in motion. She is still very animated, even though she took a hiatus from waving in the last month. I think she just wanted to show us she would not always wave or clap on command. Thankfully, her wave has returned (because it's just so cute) and she seems to understand more of waving as a greeting when we come or go. Crawling! It is full speed ahead as she moves faster each day. She is also kneeling a good bit and looking like she'll get on her feet at any moment. 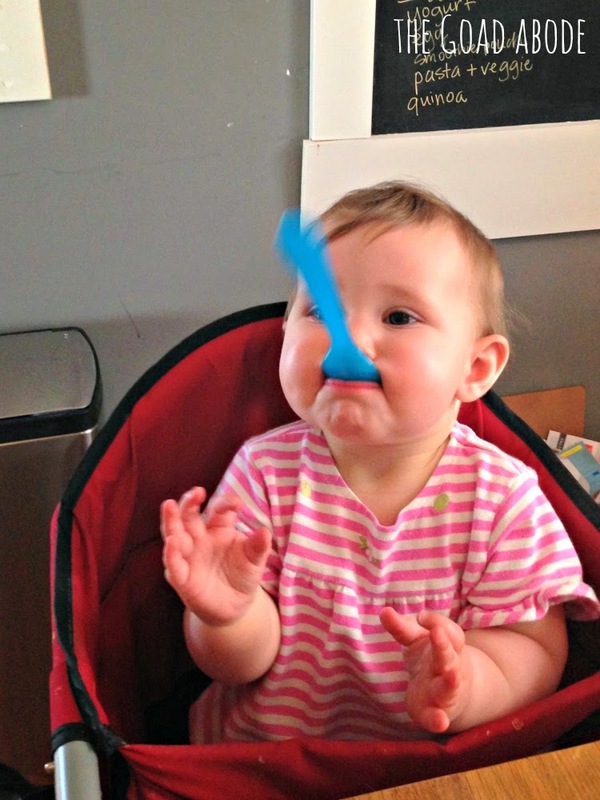 Her first taste of ice cream. I got a vanilla milkshake on Mother's Day and gave her a few sips. She loved it...smart kid! Spending more time outside (playing on a blanket in the yard and going for walks). Being silly! Her sense of humor shines through with funny faces and cackles. 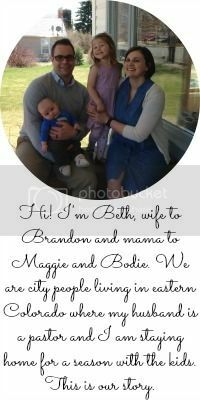 Emptying the contents of any bag or bin- my purse, her diaper bag, her toy basket, etc. Eating. She's always loved to eat, but her appetite is healthier than ever. Trying to skip her afternoon nap. Maggie's rarely successful, but she tries. Sitting on the grass. She's still getting used to it and often holds her leg or foot off the ground a bit while on the grass. We can't help but look forward to celebrating her first birthday!